Hi, I’m Amanda! I am the designer for and owner of Charming Printables, and my mission is to provide custom and charming printable designs for every occasion – weddings, baby showers, birthday parties, and even just everyday printables for your home. I believe that there are so many events in life that should be celebrated and memorable, and it’s even better when they can be affordable and accessible to anyone. With a lifelong passion for interior design and a newfound excitement for event planning following our 2011 wedding, I started this business after a decision to leave my career in music education. Guided by my amazing husband, a talented and successful graphic designer, I threw myself into learning all about Illustrator and Photoshop, practicing and creating new designs for hours on end. In early 2012 came the idea to start a business selling printable party decorations and home decor, and so Cherry Blossom Charm was born. My husband and I welcomed our first child, a beautiful baby girl, in May of 2016. After some time off, and then some time transitioning to a new normal as a full-time, work from “home” mom, I decided in early 2018 that my business needed a rename/rebrand to better reflect the products I offer. 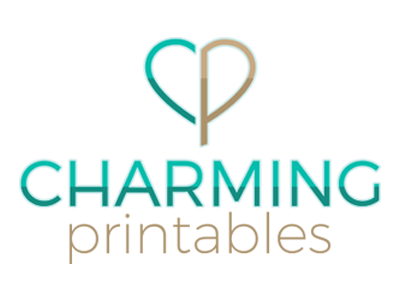 I am so excited to now be designing and selling solely under the name Charming Printables (which has always been my Etsy name, anyway). I love knowing and am so flattered that my customers choose my designs to have a part in some of their most wonderful and memorable celebrations!